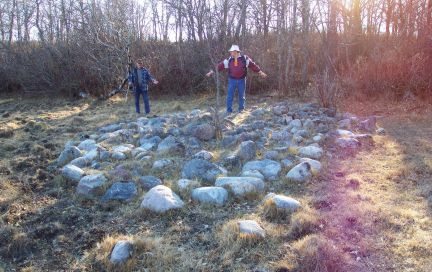 Moncur Board member Jeff Cannon (left) and volunteer Gord Powell (right) stand on a platform formed of closely set stones. The platform is below the surrounding ridge lines on the property located in the bush back of the Turtle’s Brow. Stone markers on the ridges align through the platform on the usual astronomic sight lines (eg. summer solstice.) Several trails converge nearby. Mythologically, the platform may be shaped to represent the great turtle climbing out of the primevil mud. (the low lying ground would flood in most springs.) It may have been a ceremonial site given the presence within the platform of three varieties of plant found commonly in medicine bundles and the absence of any others.